However, it’s worth the cost and effort, and, driving an MGA on a sunny day is still one of the best cures for that crappy day feeling, for the blues, or just to make one feel a bit special. Kids love to let you know that they ‘dig’ your car, they holler, give you thumbs up, high-five, smiles and whistles. It sort-of makes one feel ‘cool’ and young. Older people pull up along side you and comment: ”nice car”–“what year?”– “had one of those when they were new.” If you drive one you know what I mean. I’m off topic and I must get that oil changed. At our Hoser-eh’s pub nights last week we had talked about the ‘spin-on oil filter adapter’, It sounded like the way to go. No more fighting with that filthy oil filter that has become seized in its rusty holder. So, once again I put off the drive and get down to the serious business of perfecting this ancient piece of machinery. Step number 1. Look up the part number in the handy-dandy Moss catalogue. Number 2. bring up ‘bookmarks on the old computer—Little British Car Company‘– search–type in 235-940 and presto, up comes a part described as ‘Adapter kit, spin on oil filter’ MGA, MGB, thru ’67 (18G, G1, GB). Obviously this is the part I have looked for and at an excellent price to boot, thank you Jeff Zorn, MG guru. Oh, and I also need a shifter knob and the turning light green crystal (about the size of a lentil), might as well get that too. A few days later my parts arrive, an event every bit as exciting as Christmas. I take the spin-on adapter out to the garage, open the hood – sorry, bonnet – and check my replacement part’s point of destination. At first glance it looks straight forward, spin the old one off–spin the new one on. A second more careful inspection reveals a major problem. My new adapter requires, what appears to be, a short rubber hose to transports the oil from the filter back to the engine. My car’s oil filter canister is ‘sans’ hose. A trip to Mike’s house (Mike also has an MGA, only his is in top-notch condition) proves that my engine is indeed different. A quick reading of the Tech Sessions chapter on the subject (18/1 Page 115) tells me that I must have a 1500 ZA Magnette engine. My engine number is BP 15M 5724–not even an MGA engine. That should mean something really important, but for now I have hit a brick wall. What to do next? I check the condition of the oil, it’s golden and clear. Decision made. I will go for a slow, lazy drive through the old neighbourhood. “Hey, what year is that? I had one of those when they were new”,– “hey mister, nice car”. Now, there was something really important I was going to do to my little Chinese-red chariot, but for the life of me I can’t remember what that was. 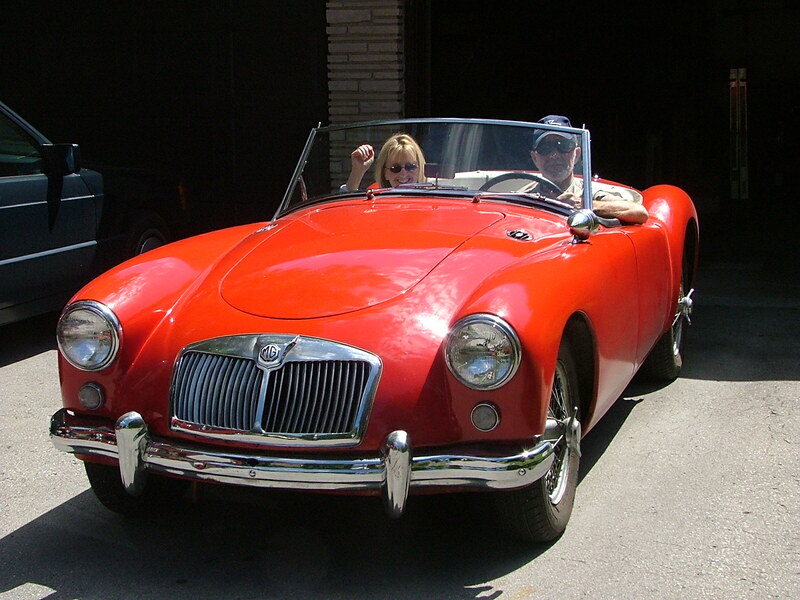 Driving my MGA always makes me feel so gosh-darned great.